Easy Cooking Recipes for healthy and Tasty Food This recipe blog is a collection of both vegetarian and non-vegetarian recipes, featuring recipes from the Indian Cuisine, Chicken Recipes, Mutton Recipes, Chettinad Recipes, Kerala Style Recipes, Biryani Recipes, Authentic Indian Recipes, Traditional recipes, North Indian and South Indian Recipes, Indian Sweets and Desserts. These simple recipes are quite easy and can easily be made at home by beginners and amateur cooks. Spread the Joy of Cooking !!! This is the first lunch box in our lunch box series and today we will look at the recipe to make paruppu sadam, kovakkai fry and mini uthappam. 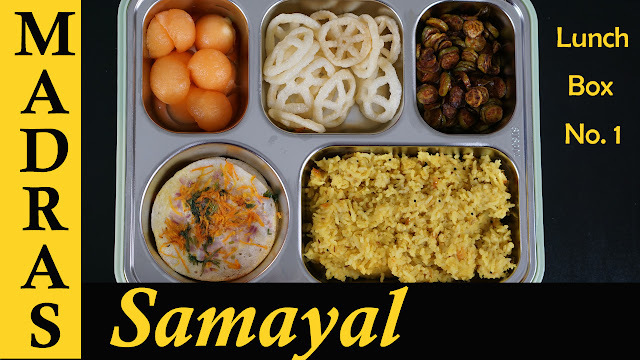 Please click here to watch Lunch box recipe in Tamil in Madras Samayal. Step 1) Wash and soak thoor dal in water for 15 minutes, then add rice to it and rinse well. Keep it aside. Step 2) Heat oil and ghee in a cooker and temper with mustard seeds, urad dal, cunin seeds, green chilies, red chilies, garlic, shallots and cook for a minute. Step 3) Then add tomato and cook for few more minutes. Now to this add asafoetida and turmeric powder, mix well. Step 4) Now add in the rice + dhal, water and required salt. Cook for 1 whistle on medium heat. Step 5) Melt ghee in a pan and then add some curry leaves and add it to the cooked dal and rice, mix well and is ready to be served. Step 1) Heat oil in a pan and add kovakkai, cover and half cook the kovakkai. Step 2) Once it is half done add the masalas - turmeric powder, garam masala, chili powder and salt. Cook until its nicely roasted. Step 1) Heat a pan and add a ladle of dosa batter, sprinkle some onion, carrot and coriander leaves on the top. Finally add some oil, cover and cook until its cooked. That's it our delicious colorful lunch box is ready to be enjoyed.Happy Cooking !!! Looking for a Recipe ?? Contents of the site is copyrighted 2017 © Steffi's Recipes. Powered by Blogger.